Giant soybeans are among the latest candidates for possible cellulose ethanol production. Some of these plants, bred by ARS geneticist Thomas E. Devine, are 7 feet tall and have stalks the size of a tree sapling. Cellulose is one of the components in the thick stalks that give them strength. 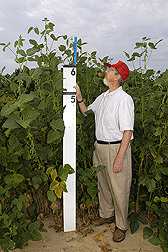 Crops like soybeans could have a tendency to lodge, or fall over, as they grow taller. But last summer, Devine noticed that plants from one line of his giant soybeans had an exceptional ability to stand up straight throughout the season. These plants did not lodge, despite their height. Strong Enough for Furniture . . .
Devine, who is with the Sustainable Agricultural Systems Laboratory, in Beltsville, Maryland, took the plants to Justin Barone, a chemical engineer at the ARS Environmental Management and Byproduct Utilization Laboratory, also in Beltsville. Barone performed a heat-measurement test on a piece of stalk. The stalk took as long to heat up as a piece of pine 2x4 board did. This suggests that cellulose fibers from giant soybean stalks may be strong enough to be made into substitute wood products, such as particleboard, Barone says. The woody biomass of the stalks could also be made into briquettes for combustion to provide energy. On the reverse side, Barone and Devine believe that the weaker lines of giant soybeans—those that lodged—could be useful for converting into ethanol. “The big obstacle to ethanol production is finding new enzymes that can break down tough cellulose,” Barone says. “We figured, why not just use plants with weaker cellulose?” The strength of cellulose is determined by several factors, such as the size and number of crystals that make it up. Two years ago, Devine and ARS agronomist James McMurtrey (recently retired) conducted a study in which they left harvested stalks of several soybean lines and cultivars on the ground for 2 years. Some lines were degraded by soil microbes more rapidly than others. This suggests that the stalks of lines that are more rapidly degraded might be converted to ethanol with existing microbial enzymes. Barone hopes to design a test that breeders could use to determine the strength or weakness of a plant’s cellulose. “Too much cellulose and it is not practical to convert to ethanol but could be perfect as a wood substitute; too little and a plant can’t grow properly,” Barone says. Devine thinks that soybeans could be a valuable crop to convert to ethanol and other products because it uses biologically fixed nitrogen. That means it doesn’t need manufactured nitrogen fertilizer. “It takes natural gas to make nitrogen fertilizer,” Devine says. “Eliminating it helps ensure that producing ethanol from soybean cellulose uses less energy than producing it from crops that require nitrogen fertilizer.”—By Don Comis, Agricultural Research Service Information Staff. This research is part of Integrated Agricultural Systems (#207) and Bioenergy and Energy Alternatives (#307), two ARS National Programs described on the World Wide Web at www.nps.ars.usda.gov. Thomas E. Devine is with the USDA-ARS Sustainable Agricultural Systems Laboratory, 10300 Baltimore Ave., Bldg. 001, Beltsville, MD 20705-2350; phone (301) 504-6375, fax (301) 504-6491. "Turning Soybean Plants Into Ethanol or Particleboard" was published in the November/December 2006 issue of Agricultural Research magazine.